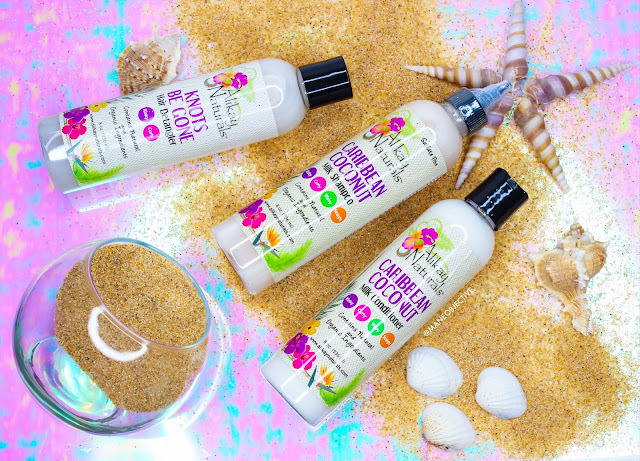 Creamy coconut milk in shampoo form! I'm sure you've gotten the memo by now that Melted Coconut Oil Season is upon us. If your coconut oil hasn't completely liquefied by now, it will at least soften substantially in the coming weeks. Coconut oil lovers, get ready - it's your time to shine (literally). But if you're not completely sold on the tropical oil, how about its milkier, creamier, nutritious and delicious cousin - coconut milk? Coconut milk is the liquid that's extracted from the flesh of grated or pressed coconuts by soaking it in water. It's rich in vitamins B1, B3, B5, B6, C, E, and a number of essential minerals with a whole host of benefits for the hair. Basically, it's a blessing for your hair and scalp, in liquid form. Thanks to Vitamins B1 and B3 contained in coconut milk, this creamy goodness contributes to the proper nourishment of follicles, while Vitamin C stimumates the follicles and encourages hair growth. Vitamin B1 (Thiamin), B3 (Niacin) contribute to the proper nourishment of hair follicle cells. Vitamin C stimulates the scalp and encourages hair growth. Because the hair is properly nourished at the root, the follicle is strengthened. When you have strong follicles, shedding and hair fall from manipulation and combing is reduced. Vitamin B5 is a powerhouse ingredient found in lots of strengthening formulations. Luckily, it occurs naturally in coconut milk. Vitamin B5 aka Pantothenic Acid gives hair flexibility and shine - boosting elasticity and greatly reducing breakage. Coconut milk, like it's oily counterpart is great for adding natural luster to dry, dull hair thanks to Vitamins E and B5. Coconut milk contains two powerhouse ingredients with major scalp health benefits. Vitamin B6 aka (Pyridoxine) helps prevent dandruff, while lauric acid gives coconut milk its antifungal, antibacterial, and antiviral properties. Combined, these two help fight itching, flakes, and irritations of the scalp. Thanks to Vitamin E, coconut milk contains powerful antioxidant, anti-aging, and anti-inflammatory, properties. Coconut milk helps reverse signs of aging and damage in hair - leaving it stronger, fuller, and more resilient. Because coconut milk contains so many powerhouse nutrients for scalp health and hair growth, it makes an excellent topical solution for thinning or damaged edges. Using products with coconut milk, or massaging coconut milk itself into your edges on wash day helps stimulate hair regrowth. Something about Alikay Naturals makes me always wanna go to the beach. 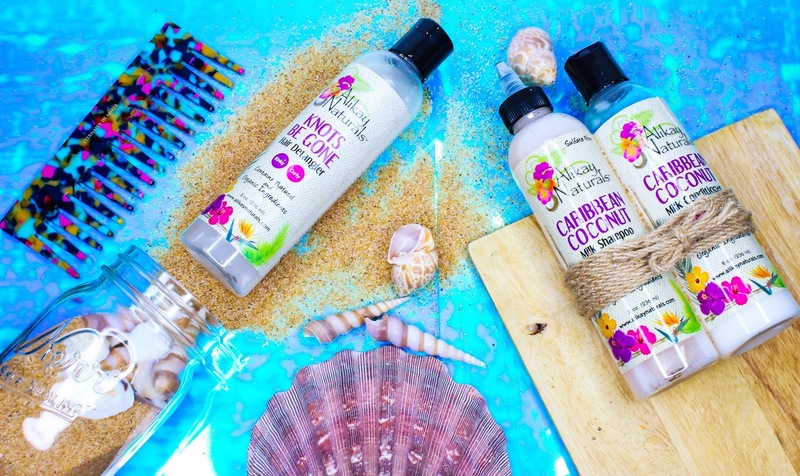 I've been using the Alikay Naturals Caribbean Coconut Milk Shampoo and Conditioner - and I've fallen in love! I created a video - because I'm trying to be better in 2017 about thorough and informative content. And I wanted to show you guys how absolutely fantastic these products are. 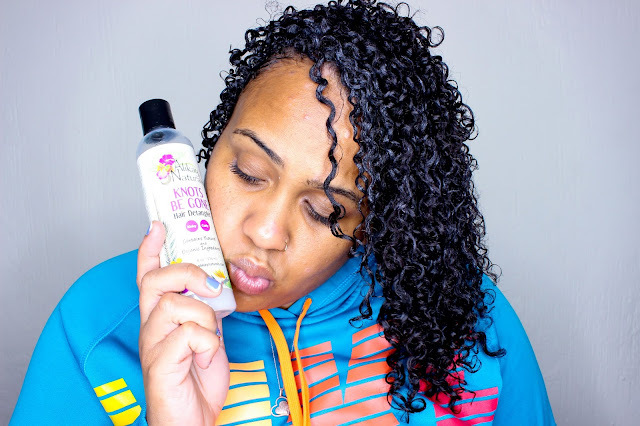 Rinse hair with water and generously apply Alikay Naturals Knots Be Gone Hair Detangler. I personally prefer to detangle on wet hair, because it results in the least amount of breakage and makes it easier to work product through my hair and release tangles. Shampoo with Alikay Naturals Caribbean Coconut Milk Shampoo. This shampoo is very liquidy and comes with a nozzle tip to help concentrate on the scalp. After applying throughout my scalp, I massaged it in to gently lift dirt, flakes, oils, and debris. As the Caribbean Coconut Milk Shampoo lathered, it traveled down the length of my hair, and I used the slippery suds to help keep my curls detangled. Super thick. Super creamy. Super amazing! Rinse hair thoroughly and apply Alikay Naturals Caribbean Coconut Milk Conditioner throughout. 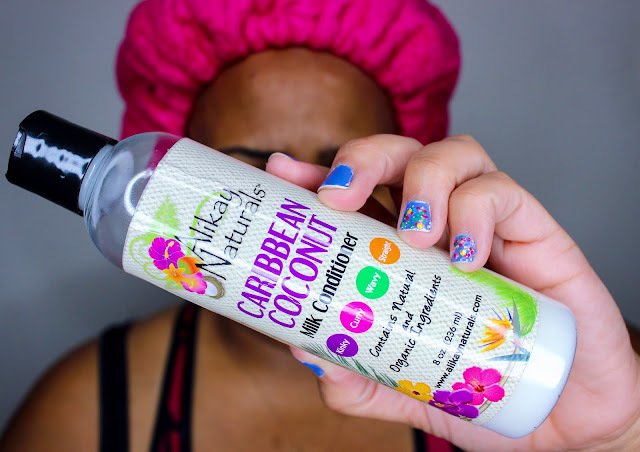 Before sectioning off my hair, I used my fingertips to massage more Caribbean Coconut Milk Conditioner throughout my scalp. I then parted my hair in 4 sections, detangled with a wide tooth comb to distribute product from root to end, and twisted each section. I clipped my hair up, put on a plastic shower cap and my Hot Head, and let the Caribbean Coconut Milk Conditioner marinate for 20 minutes. Rinse and style! Upon noticing that Knots Be Gone didn't leave a bunch of white gunky residue when it came into contact with my product buildup from a previous wash n' go, I decided to give it a whirl as a leave-in conditioner. I applied it generously to each section of my hair while it was soaking wet, and proceeded to style. And that's it! Super easy, super simple, straight to the point - and full of amazing benefits for the hair and scalp. Before I close this blog post out, I'm going to leave you guys with a mini-review of each product I used. Alikay Naturals didn't ask me to do this - but these products are too good to leave you guys in the dark. For each product used, I'm going to share the active ingredients, my likes and dislikes, and where to purchase. Marshmallow Root Powder: Extraction that creates a slippery, mucous-like substance that adds incredible slip (translation: awesome detangling), and contains high amounts of plant proteins for strengthening and conditioning hair. I also doubled back and used Knots Be Gone as my leave-in for my wash n' go. I LOVED the results. My hair maintained serious moisture, softness, and shine - even when used in conjunction with notoriously drying EcoStyler. Even after sitting in the dry, hot sauna at my gym. Coconut Milk Powder: Concentrated dehydrated coconut milk. Same benefits listed as above - powdered coconut milk just doesn't expire as quickly. Ummmm everything. I'm actually kinda salty that nobody tried to put me up on game about this shampoo. It smells amazing, has great slip (which is always a plus for me in shampoos), cleans the scalp well, and doesn't leave my hair feeling stripped or dry. The lather is a bonus - especially if you like to see sudsing action, and it's totally sulfate free. 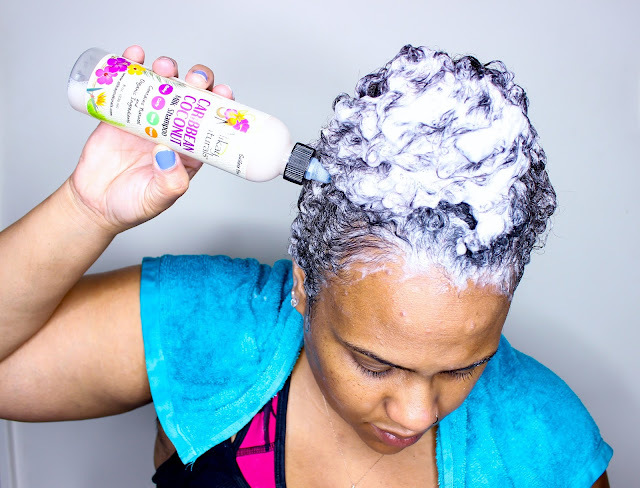 Caribbean Coconut Milk Shampoo was so easy to use, and made my wash day a breeze. Somebody take me to the ocean already. lol! So creamy. So rich. So thick. Soooooo good. There was absolutely no way I was gonna just let Caribbean Coconut Milk Conditioner sit on my hair for 2 or 3 minutes and send all that goodness down the drain. No ma'am! With all the amazing ingredients it contains for scalp and hair health, plus that amazing consistency - I treat this bad boy like a deep conditioner. It penetrates my lower porosity sections, has great slip, and leaves my hair feeling soft, moisturized, strong, and shiny. Which is crazy, considering it's protein free! I gotta be honest - it was a bit difficult to get this stuff out the bottle after the first few squeezes. Because it's so slippery, creamy, and thick, I kept loosing my grip trying to work product out of the bottle. I definitely think Caribbean Coconut Milk Conditioner belongs in a jar for ease of use. Because I normally cover this point in my full-length reviews, I need to let you guys know that all 3 products are silicone and protein free. Curly girls method loyalists and protein sensitive naturalistas rejoice! Alikay Naturals products are sold nationwide at Target stores. Click here to find the location nearest you. You can also find Knots Be Gone at the Hawthorne Target store on 120th and Crenshaw. Who's hopping on the coconut milk trend with me for Summer '17? Let me know in the comments below! Per the FTC, I have to let y'all know that this post and video is sponsored by Alikay Naturals. And there's affiliate links in here, meaning if you click the Target link and purchase the products, I'll make a few coins. Y'all don't mind, right? Even though this content is sponsored that doesn't mean anything - I'm still keeping it 100 and giving you guys the real. Coconut oil alone does not benefit hair it also benefits skin when applied or utilized properly. Coconut oil is generally used to heals or vanish scars. Also, it is a good regimen to prevent wrinkles.